Friday night was very low key – dinner at Olive Garden and then a spin through Hobby Lobby to pick up some Christmas wrapping supplies. This required that I take a picture of myself using the green roll of wrapping paper I bought as a light saber in the parking lot. It’s a time honored tradition at our home to use wrapping paper rolls as the Jedi weapon of choice; I was taught many moons ago by my Dad – complete with sound effects. I passed the rest of my evening wrapping presents and watching a (semi) Christmas movie; Frozen. It was a nice and relaxing way to pass a Friday night and I so enjoyed sitting on my couch, wrapping up gifts for my family and friends while humming along to “Let It Go”… I also caught a snippet of Home Alone 2: Lost in New York and listen here – that would never happen today. I’m not entirely certain how it was plausible back in the 90’s – but there is no way it would happen today. The kid wouldn’t even make it on the flight…let alone make it in New York. Saturday was another really nice day – for the most part. I didn’t really sleep in that late…but I did enjoy sipping my coffee by the fire and slowly getting ready to tackle the day. I went out and did some Christmas shopping…hopping from store to store being a bit of a Christmas elf and getting a large majority of my shopping done before noon! 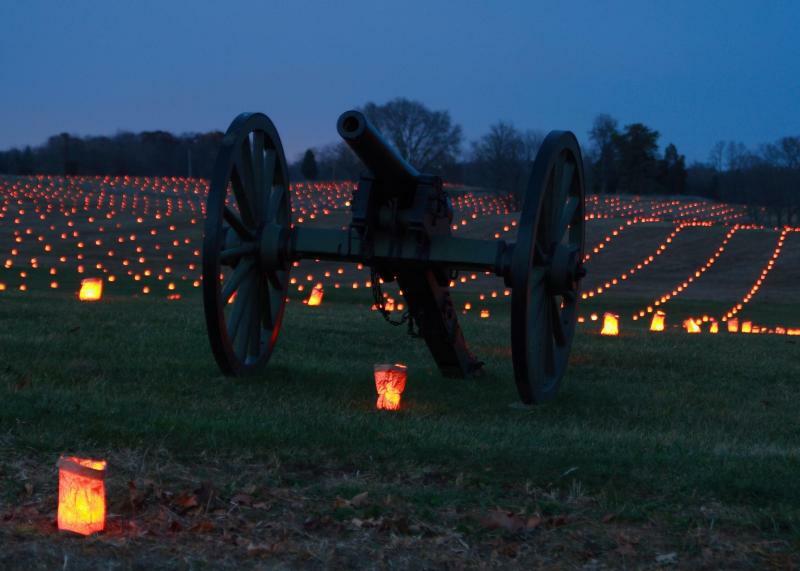 Antietam National Battlefield has an annual Memorial Illumination that includes luminaries for all the men killed during the fighting at Antietam and we decided to scoot over to Maryland and check it out. Well – that was a nice thought but it didn’t exactly play out that way. The line stretched back from the entrance for at least two miles and although the gates opened at 6:00…we didn’t arrive at the entrance until almost 8:45! This picture is what we would have seen – but alas – we moved on to burgers, fries and going home to get in the bed! Thinking we’d at least have to wait a little bit, I’d downloaded two episodes of Alias Grace to my phone and during our wait, I managed to watch them both…so I was through four of the six episodes by the time Saturday came to a close. Sunday morning I watched the newest episode of Outlander while sipping my delicious coffee – a tradition that will end after the season finale of Outlander‘s third season next week. *sigh* I got in some exercise and did some laundry while my parent’s attended a question/answer session at a church we’d been visiting and of course, between the 45 minutes on the elliptical and other things, I finished Alias Grace before lunch. We “cleaned out the fridge” for our lunch, eating all the leftovers that we had before heading out to do the Winchester Holiday Tour of Homes. I took so many pictures that I’m going to post about that tomorrow – after a rather crowded and discombobulated first house, the other three were organized, interesting and delightful! The houses were all quite old but had been updated, while maintaining their original charm – but like I said – more on that tomorrow! The weekend was ended on a lovely note – my Mom and I went to the movies to see Coco, the newest Disney/Pixar film and it was absolutely so good! The story was touching, unique and compelling and the colors in the film were astounding – it was such a good movie, I highly recommend it! And apparently some people are complaining about the twenty minute short Olaf’s Frozen Adventure at the beginning – but I thought it was delightful too and honestly; isn’t that getting more bang for your buck?? I can’t believe the first weekend in December has already come and gone – the year is rushing toward it’s conclusion!